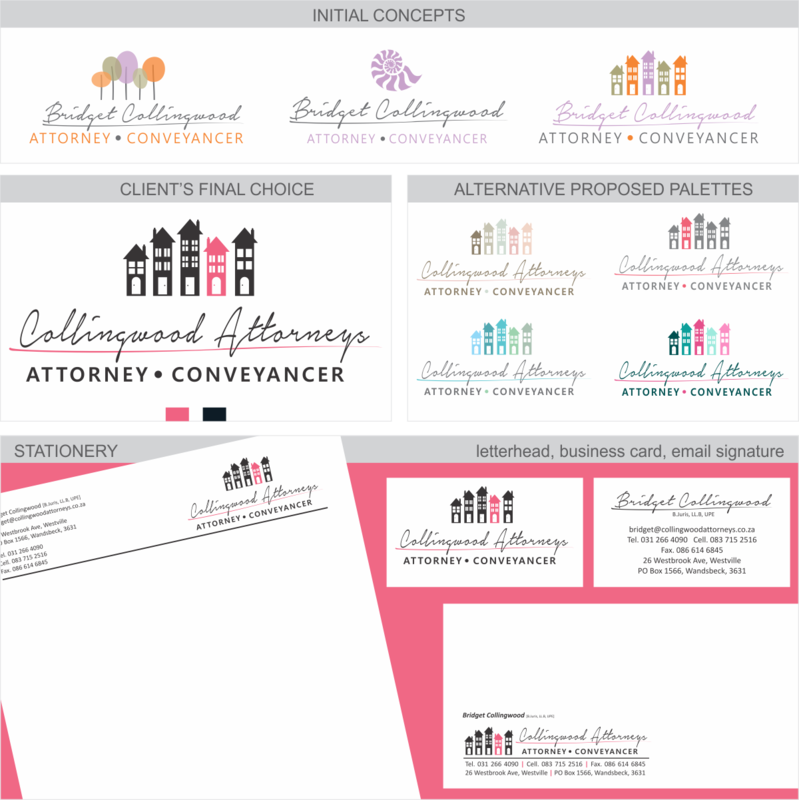 Here's a recent logo development and branding project (one of many) that we completed recently for Collingwood Attorneys. The client's brief requested us to use trees, a conch shell, or houses. She wasn't 100% sure what colours she wanted to work with but her preferences were greens pinks, and/or orange with black. She wanted it to look professional but with a feminine touch. As you can see, our initial concepts included all 3 of her preferences, and she loved the one with the houses. Her only request was to change the company name to Collingwood Attorneys instead of her name and to use black instead of charcoal. Initially we used greys instead of black as we felt the black was a bit hard and they greys softer. The black gives a more dramatic feel but we think it works. There were so many awesome colour palettes that could've been used (see alternative proposed palettes for a few that we suggested), that it took a little time for our client to decide. Her final choice was a coral pink with black. Her stationery (letterhead, business cards and email signature) was in a typically classic style, plain and simple. She didn't want anything fancy or too 'designed', in order to reflect old-school principles and ethics. We hope Bridget's clients love her new image as much as we loved creating it!